Oral sub-mucous fibrosis (OSMF) is a pre-neoplastic condition of the oral cavitythat causes significant loss of mouth function, because of reduced mouth opening. ,,,, OSMF is predominantly seen in south-east Asian countries with female:male ratio of 3:1 and in the age group of 45-54 years. The condition is characterized by burning sensation to spicy foods, and progressive trismus with/without difficulty in protrusion of tongue. A major risk factor for development of OSMF is areca nut/betel quid chewing. , The alkaloids and tannins from betel quid can cause fibrosis of lamina propria and formation of fibrous bands in the buccal mucosa and oropharynx. , This leads to narrowing of mouth opening and hampers the oral hygiene. Patients with OSMF often present with compromised oral hygiene. Due to reduced mouth opening, it is very difficult for a clinician to perform dental procedures. The condition can get even worse in endodontic treatment of such patients, especially if endodontic therapy of molars is required. The extent of inter-incisal opening in OSMF patients can vary according to the clinical features of the patient. Usually, the inter-incisal opening of OSMF patients is 11-20 mm; however, can reduce below 10 mm in cases with progressive OSMF. , The size of a conventional endodontic instrument is 21 mm, excluding its plastic handle (approx 8 mm) and is very difficult to use it in posterior areas in OSMF patients with compromised mouth opening. A case report is presented involving endodontic management of mandibular molars in patient with OSMF, using modified endodontic instruments. A 46-year-old woman presented with spontaneous and temperature related pain, on the left side of the face for two weeks. There was no pain on biting. The patient also complained of burning sensation on the buccal mucosa while eating spicy foods. There was a progressive reduction in the mouth opening since past 4 years. The inter-incisal opening was 18 mm [Figure 1]a. She gave a history of areca nut chewing for more than 15 years. There was no history of smoking or alcohol intake. There was no other relevant medical history. Intra-oral examination revealed numerous aphthous ulcers with blanching of oral mucosa and tongue. The tongue was patchy bald, that is, showed absence of papillae, and the patient was unable to protrude tongue beyond the vermillion border of the lips. Thick fibrous bands were palpable on the buccal mucosa of both sides. Oral hygiene status was poor. The mandibular left first molar had a deep carious lesion. There was no associated buccal or lingual cortical swelling or tenderness. Patient gave prolonged response to thermal tests. Electric pulp testing (Vitality Scanner, Analytic Technology, Glendora, CA, USA) was indicative of irreversible pulp damage. A diagnosis of symptomatic irreversible pulpitis was made. After extensive clinical and radiographic examination, the mandibular left first molar was prepared for non-surgical endodontic therapy. An emergency endodontic access opening with pulpectomywas planned for the patient, to relieve her of tha pain. This was to be followed by intra-lesional steroid injections and mouth opening exercises, till an acceptable mouth opening was achieved to complete the endodontic procedure. The treatment plan and the procedure was explained and discussed with the patient; and, an informed consent was taken. Because of reduced mouth opening, Vazirani-Akinosi closed-mouth anesthesia was given with 2.2 ml of 2% lidocaine with 1:100,000 epinephrine. It has been shown in some recent studies  that addition buccal and lingual infiltrations of 4% articaine increase the success rates in patients with irreversible pulpitis, and thus, buccal-plus-lingual infiltrations of 4% articaine with 1:200,000 epinephrine were given. Rubber dam placement was not possible due to reduced mouth opening. 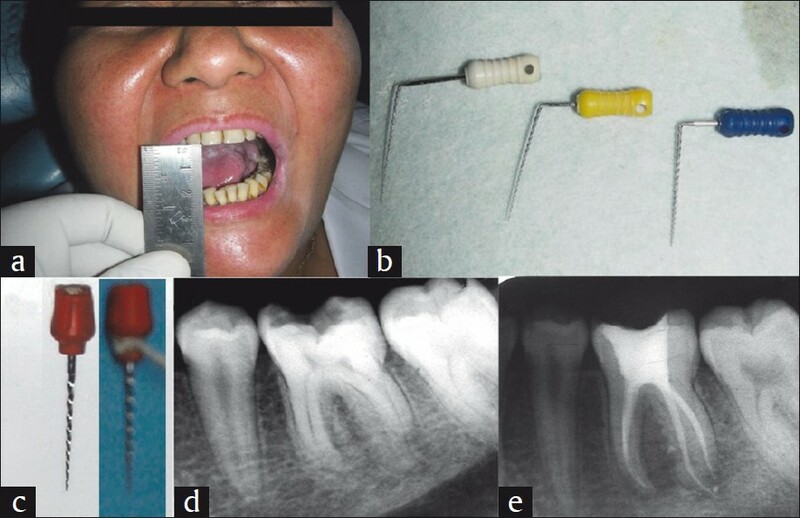 All the endodontic instruments were tied with dental floss to prevent their swallowing. An endodontic access opening was made; however, the clinician was still unable to insert the endodontic instruments into the canals. Therefore, the instruments were bent at an obtuse angle at the shank, where the flutes ended [Figure 1]b. This reduced the length of the instruments to 16 mm. Tooth was isolated with cotton rolls in the buccal and lingual vestibule. The clinician held the instruments with the help of its plastic handle; and, gently debrided the pulp canal space under copious irrigation. The endodontic access was modified to a trapezoidal shape with the help of slow speed diamond KGS3203 (DentsplyMaillefer, Ballaigues, Switzerland) to improve access to the additional distal canal. Four canals: Mesio-lingual; mesio-buccal; disto-lingual; and, disto-buccal, were located. Because there was high risk of fracture of bent endodontic instruments, the canals were very gently instrumented. An alternate irrigation with 5.25% Sodium hypochlorite (NaOCL) (Fórmula e Ação,São Paulo, Brazil), 17% Ethylenediaminetetraacetic acid(EDTA) solution (pH 7.4) (REDTA, Roth International, Chicago, IL, USA) and 2% chlorhexidine solution (Sigma Chemicals, St. Louis, MO, USA) was used. An intra-canal dressing of commercially available calcium hydroxide dressing was given. A sterile cotton pellet was placed in the pulp chamber, and the access cavity was double sealed with an intermediate restorative material (IRM, Dentsply De Trey GmbH, Konstanz, Germany) and Glass ionomer cement (Ketac Molar, 3M ESPE). Patient was advised 2% Chlorhexidine mouthwash rinse and cessation of areca nut chewing. At the next appointment after 5 days, the patient was asymptomatic. Submucosal injection of 40 mg triamcinolone acetonide in 2 ml of 2% lidocaine was given bilaterally. Patient was advised mouth opening exercises with ice-cream sticks. Vitamin B supplements were also given. After 6 weeks, the patient showed a marked improvement in mouth opening, which increased to 28 mm. Endodontic therapy was completed using modified ProTaper instruments [Figure 1]c. To reduce the length of instruments, the handles of the instruments were cut in half. Though there was an increase in mouth opening, rubber dam placement was yet not feasible. The instruments were tied with dental floss near the junction of handle and the file. The working lengths of each canal were estimated by means of an electronic apex locator (Root ZX, Morita, Tokyo, Japan), and then confirmed by a radiograph. One week later, all the canals were obturated with Tubli-seal (Kerr UK, Peterborough, U.K.) and laterally condensed gutta-percha points using hand pluggers. Final radiograph was taken to establish the quality of the obturation [Figure 1]d and e. After completion of root canal treatment, the tooth was restored with a posterior composite filling (P60, 3M Dental Products, St. Paul, Minn). The clinical diagnosis of OSMF reliesy solely on the signs and symptoms. ,, These include reduced mouth opening, difficulty in protrusion of tongue, recurrent aphthous stomatitis, burning sensation to spicy foods, reduced/absence of papilla on tongue and formation of thick vertical fibrous bands in the buccal mucosa. Histological confirmation by biopsy is usually not indicated as it may lead to formation of a scar tissue and further reduction in mouth opening. Due to reduced mouth opening, the patients of OSMF often face the detrimental effects of poor oral hygiene. In the present case, it was very difficult to perform endodontic therapy. A Vazirani-Akinosi closed-mouth anesthesia was given, as conventional inferior alveolar nerve block anesthesia was difficult to administer. Rubber dam placement was not feasible and the endodontic instruments were tied with a dental floss. Because of reduced inter-incisal opening, the use of conventional standard sized instruments was not feasible. The stainless steel hand instruments were bent at D16 level. At this level, the part of file with the cutting edges joins with the shank of the file and it is a comparatively weak junction as compared with rest of the shank. Thus, the instruments were gently inserted into the canals. Fresh instruments were used at every change of instruments; and, caution was taken not to use the same instrument multiple number of times. Minimal filing with gentle force was done with each instrument to prevent its fracture. A dentin softening regimen consisting of alternate use of NaOCL, EDTA and Chlorhexidine was utilized during instrumentation of the canals. After thorough debridement of the canals, an interim dressing was given. Treatment of OSMF was initiated at a later appointment. After improvement in the mouth opening, the root canal treatment was completed. This case report highlights the endodontic management of a patient with compromised mouth opening. OSMF has a strong correlation with neoplastic transformation. The patients of OSMF should be strictly advised to stop all oral tobacco/betel nut chewing habits and should be kept on a periodic follow-up. 1. Celik N, Wei FC, Chang YM, Yang WG, Chen DJ, Tsai CY. Squamous cell carcinoma of the oral mucosa after release of submucous fibrosis and bilateral small radial forearm flap reconstruction. Plast Reconstr Surg 2001;107:1679-83. 2. Cox SC, Walker DM. Oral submucous fibrosis: A review. Aust Dent J 1996;41:294-9. 3. Shah B, Lewis MAO, Bedi R. Oral submucous fibrosis in an 11-year-old Bangladeshi girl living in the United Kingdom. Br Dent J 2001;191:130-2. 4. Rajendran R. Oral submucous fibrosis: Etiology, pathogenesis and future research. Bull World Health Organ 1994;72:985-96. 5. Hazarey VK, Erlewad DM, Mundhe KA, Ughade SN. Oral submucous fibrosis: Study of 1000 cases from Central India. J Oral Pathol Med 2006;35:1-6. 6. Aggarwal V, Jain A, Debipada K. Anesthetic efficacy of supplemental buccal and lingual infiltrations of articaine and lidocaine following an inferior alveolar nerve block in patients with irreversible pulpitis. J Endod 2009;35:147-50. 7. Schwartz J. Atrophia Idiopathica (tropica) mucosae oris. Demonstrated at the Eleventh International Dental Congress, London, 1952 (cited by Rajendran R). Bull World Health Organ 1994;72:985-96. 8. Joshi SG. Submucous fibrosis of the palate and pillars. Ind J Otolaryn 1953;4:1-4. 9. Pindborg JJ, Sirsat SM. Oral submucous fibrosis. Oral Surg Oral Med Oral Pathol 1966;22:764-79. 10. Trivedy CR, Warnakulasuriya KA, Peters TJ, Senkus R, Hazarey VK, Johnson NW. Raised tissue copper levels in oral submucous fibrosis. J Oral Pathol Med 2000;29:241-8. 11. Sirsat SM, Khanolkar VR. Submucous fibrosis of the palate in diet pre-conditioned wistar rats: Induction by local painting of capsaicin-optical and electron microscope study. Arch Pathol 1960;70:171-9. 12. Canniff JP, Harvey W, Harris M.Oral submucous fibrosis: Its pathogenesis and management. Br Dent J 1986;160:429-34.